Crain’s Chicago Business managing editor Ann Dwyer reports that renovations of the iconic Union Station are on the fast track. A biotech billionaire invests in Tribune Publishing to bring the print newspaper back to life. And Chicago sports teams tap past heroes to be team ambassadors. The Union Station air rights are up for sale. The schedule to rehab Union Station just got fast-tracked with Amtrak seeking a developer. Currently, 70 percent of the iconic train station’s original space is walled off. Dwyer said many developers are eager to get their hands on the millions of square feet of unused space in Union Station. “This is an idea that’s been in the works for many years. What’s changed…is the vibrancy of the downtown market. There are so many developers prowling around the Loop looking for opportunities to build, be it residential, retail or office space and this is a project that offers to do [that] with many millions of square feet of all three of those things,” Dwyer said. Renovations have been in the “planning” phase for some time, but hundreds of millions of low-interest federal funds in the form of Railroad Rehabilitation and Infrastructure funding is speeding up the process. Dwyer said it will be a mix of funding, including private developers and possibly Metra, which uses the station. The air rights are also up for grabs, meaning developers would build above the tracks and existing building, much like what was done over the train tracks along Millennium Park. Union Station is the third busiest rail terminal in the U.S. and serves millions of passengers as a transportation hub. A billionaire biotech cancer-research pioneer has made a $70.5 million investment in Tribune Publishing, becoming the second-largest shareholder to Michael Ferro. Patrick Soon-Shiong becomes vice-chairman of the board at the Tribune. Analysts believe his deal will kill the hostile takeover attempt by USA Today’s parent company, Gannett. One of Soon-Shiong's ideas is to reinvigorate the print side by integrating technology to enhance the reader experience. But will the new vice-chairman’s golden touch translate to the newspaper business? Dwyer said Soon-Shiong wants to create a more interactive newspaper, which could include moving photos. “Whether or not that technology is possible, he seems to think it is. The big question is, whether or not technology like that is going to be able to transform the experience of reading a newspaper,” Dwyer said. Chicago sports teams are turning to their heroes of the past to boost the team brands. Blackhawks alums such as Denis Savard, Bobby Hull and Jamal Mayers court corporate clients during home games. The Bulls have tapped Toni Kukoc and Horace Grant, among others, to make charity appearances and meet with sponsors. 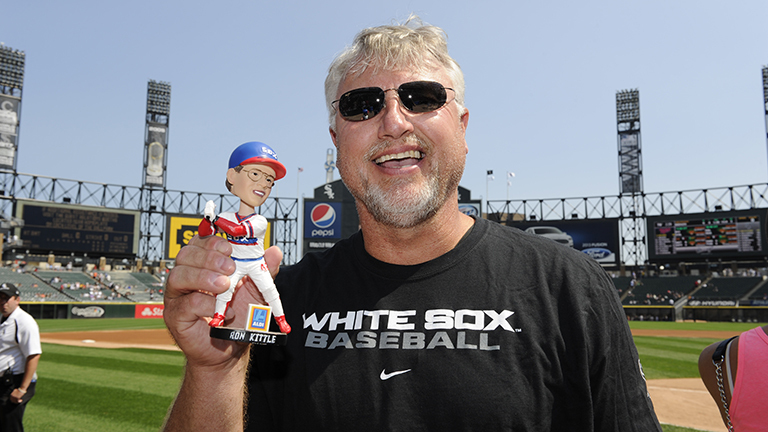 You’ll even see Ron Kittle hawking a White Sox bobblehead right on the street. The Cubs line-up includes Kerry Wood, Ryne Sandberg, Billy Williams and Fergie Jenkins. It’s a win-win for the sponsors and former players. “[It’s] a way for us to extend the player touch points without having to burden our current players to do it,” says Cubs President Crane Kenney. The former players have been doing things like charity work, talking up corporate sponsors and sales calls. “It’s a new and interesting kind of dynamic for athletes who, in past years, might have only looked at broadcasting, coaching or golfing as things they did in their retirement,” Dwyer said. May 25: How will the Obama administration’s expansion of overtime affect businesses and employee wages? We look at the new rules. May 25: Excitement on Wall Street as a possible interest rate hike approaches. Why some surprises in the U.S. economy have investors and analysts feeling good. May 19: City Planning and Development Commissioner David Reifman discusses two big redevelopment projects and the mayor's neighborhood investment initiative to help struggling neighborhoods on the South and West Sides.